A final recap is due on this historic, rugged North Yorkshire coastline (A.K.A. 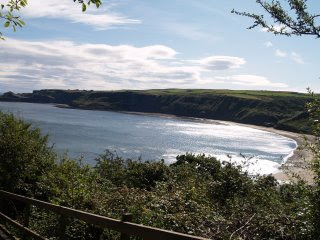 The Cleveland Way) and three other treasure towns which cling to it like limpets. Robin's Hood Bay: Once a haven for smugglers, this adorable place is a cobbled maze of stone cottages which are arranged hapharzardly on the steep cliff. Very popular with tourists, but don't let that put you off, cars are not allowed in the old village so the descent to the gorgeous beach and quay has to be made on foot. A few steps from the beach, the Bramblewick (a 17th century property which was once the village bakery) serves excellent food and drink in the prettiest of locations... beautiful. Runswick Bay: Nine miles up the coast from Whitby, Runswick Bay reveals its sweeping arc of golden sand and brightly painted fishermen's cottages - a breathtaking sight from the crest of the hill or while enjoying a pint of Black Sheep from the Royal Hotel. Such is its precarious position on the cliff, in 1664, a landslip caused the entire village to fall into the sea. It was rebuilt and remained a vibrant fishing community for several hundred years. Today, the permanent population of Runswick has dwindled to less than 20 and the fishermen have long gone. It's a place where holiday makers flock (unpeturbed by the bracing winds off the North Sea) to enjoy simple seaside pleasures - and there's not a single unsightly arcade to spoil the picture-perfect view. 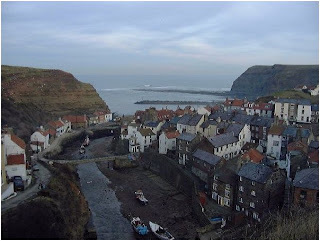 Staithes: (Also pictured at the top) Arguably the prettiest of all the cliff top villages, Staithes has been a magnet for artists for hundreds of years. In the 19th century, it became the base for a colony of renowned English Impressionists including Laura Knight - Britain's first female artist to become a Dame. The village's art scene is still vibrant and Staithes Gallery which sits on the high street is a fantastic showcase of contemporary art which has been inspired by the area. They also run an art school and rent out the original, refurbished studio used by Dame Laura herself.